As you know, I’ve been messing about with four selvedge warping this year. 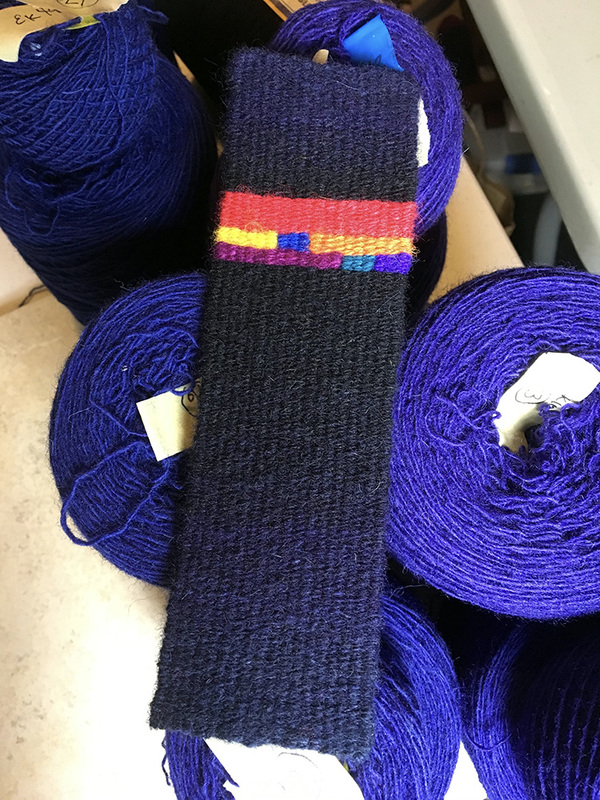 I was in one of my favorite yarn shops recently and they had a cone of the warp I like in black. Black Friday. Black warp. Why not? I’m not a shopper, so today was mostly a weaving day. To be honest, it was Robyn Spady’s idea (Robyn is a fiercely talented teacher, weaver, and the editor of Heddlecraft). She was weaving black warps today and challenged other weavers to do the same. I’m not sure she realized a tapestry weaver would jump in, but the timing was great for me. This is the warp I usually use in white. It is cotton seine twine made by Bockens in Sweden and it comes in many sizes. This particular size, 12/6, comes in a whole bunch of colors also. As a doubled four selvedge warp at 8 epi, it performed very well. And of course in four selvedge warping, there is a tiny bit of the warp that shows right at the bottom and top edges. If the color of that warp matches the edges of the tapestry, it disappears completely. Which, I must say, is very satisfying. I’m not much of a shopper. Standing in line to get into Best Buy to purchase something I probably don’t really need just doesn’t sound fun. But I know some people love the thrill of the hunt. So I’ll leave the shopping to them. I used dark colors in gradation because I’m not a total Scrooge and maybe there is some wiggle room there… and the bright shiny parts are the bright shiny things I didn’t buy today. Or maybe they are the fun times I had in my studio instead. 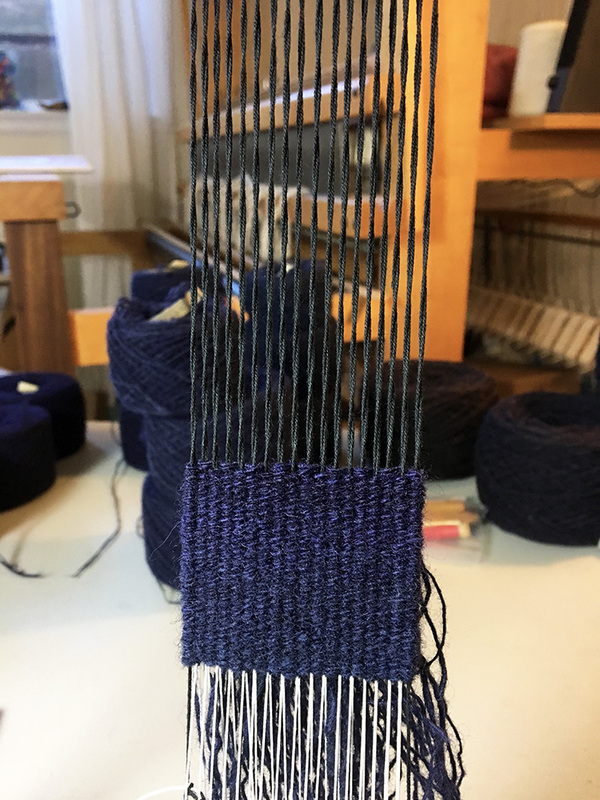 This warp was supposed to be a tapestry cuff for Sarah Swett’s four selvedge bracelet project. But I made it too wide and too short and instead of taking it off and starting over, I decided to weave this. This will be today’s tapestry diary piece. I think I’ll call it “Black Friday”. 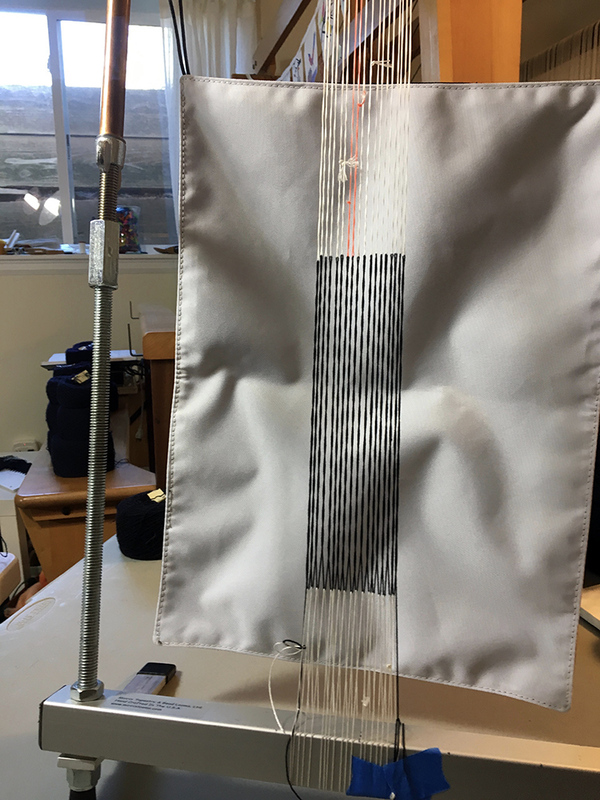 Loom is a 16 inch Mirrix warped for four selvedge weaving. The warp is 12/6 cotton seine twine in black, flyline backing for supplemental warp, 8 epi. Weft is three strands of Harrisville Koehler singles, dyed by me. Click the thumbnails below for the full image and captions. If you’re getting the blog via email, you may want to visit the website HERE to see the captions. Why else might you want to use colored warp? In traditionally woven tapestry, the warp doesn’t show. And a dark warp is visually harder to weave on. 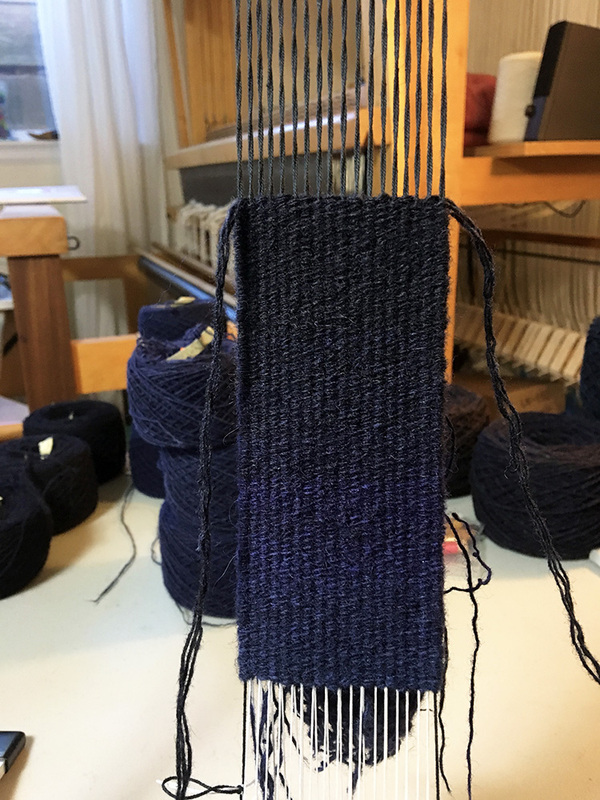 But if you’re weaving something that will have open warps or fringe, you might want to use a colored warp. This 12/6 cotton seine twine comes in so many colors, you could potentially make a warp that was a rainbow. Though warping a loom that way would be mighty tricky unless you’re using a loom with beams or you make a lot of knots. Maybe I’ll try it sometime. I don’t know of any other good tapestry warp that comes in colors, but of course you could dye it yourself or make a painted warp. Just remember that you need different dyes for cotton than you do for wool. Have you ever woven on a colored tapestry warp? Did you dye it or use a warp like this one? Tell us in the comments below.